There are as many ways to make a Christmas tree crudité or antipasti platter as there are ways to trim a real tree. This version keeps things fairly simple, but scroll down for a whole host of suggestions for trimming this tree with even more delights. The whole thing can be assembled in a snap and is fun to do with kids. Experience tells that if the kids help create it, they'll also help eat it, so bring them in the kitchen, have them wash their hands, and give them some broccoli to play with! Know that you can prep all the ingredients (trim and cut the broccoli and peppers) several hours ahead of time; feel free to assemble the tree up to an hour before serving—it holds very well at cool room temperature. 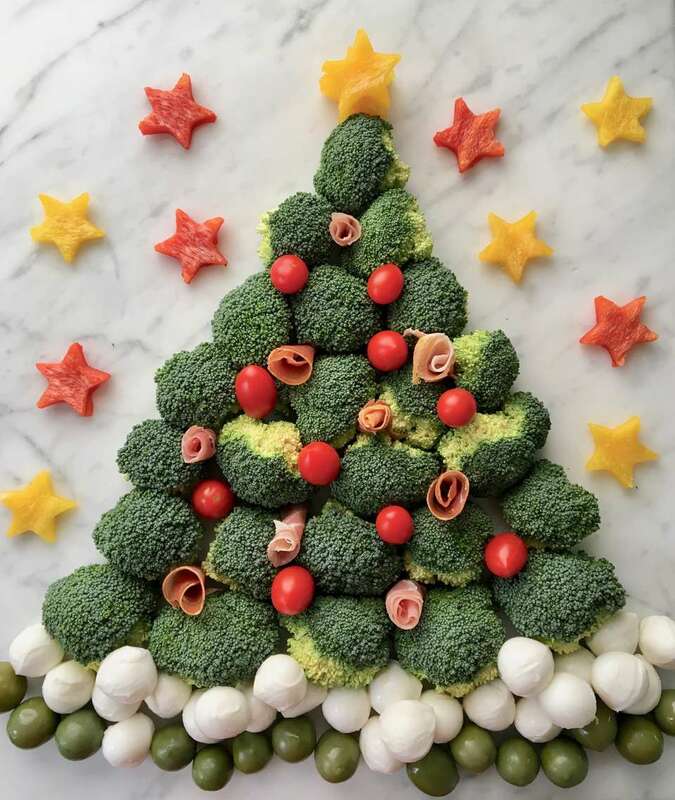 Arrange the tomatoes in between broccoli florets as "ornaments" on the tree. Trim the peppers: cut out and discard the stem and core. Trim off the rounded sections at the top and bottom to lay the pepper as flat as possible. Next trim off any white bits from inside the pepper, and use a small star cookie cutter to cut the peppers into stars. Stack several of the yellow stars at the top of the tree. Arrange the remaining stars on or around the tree. Drain the perlini and pat them dry with paper towels or a clean kitchen towel. Arrange the perlini at the base as "snow." Stacking a few on top of the others creates a lovely "drift" effect. Drain the olives and pat them dry, just like the perlini. Add them in a layer under the cheese or simply around the tree. Cut the prosciutto into quarters and gently roll the pieces into rosettes. Arrange them on tree much like the tomatoes. Voila! You have an adorable Crudité Christmas Tree! Want to keep going and really gild that tree? See below for even more ways to trim that tree. Serve with a bowl of your favorite dip—Toasted Cumin Yogurt Dip or Sweet Potato Dip are both excellent choices.